(noun) 1. An official inspection of an individual’s or organization’s accounts, records, and documents, typically by an independent body. (verb) 1. To conduct an official financial examination of an individual’s or organization’s accounts. Traditionally, an audit is not associated with being positive, beneficial experiences, as they are typically done by an independent institution, such as the IRS. However, in our personal lives, audits can be very advantageous and insightful. 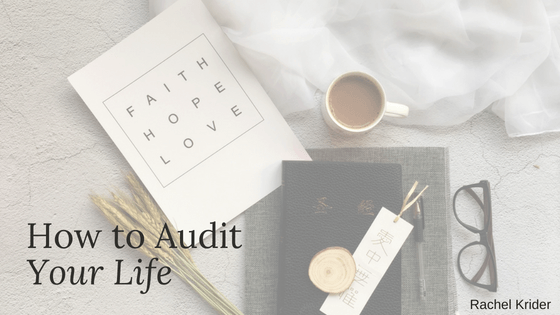 Results of a life audit can mean significant changes to work, relationships, and personal well-being. A life audit is an exercise in self-reflection aimed at uncovering distractions, recognizing your life themes, and the core values that drive and inspire you. Unlike New Year’s resolutions, life audits can be done at any point in time and can help individuals take charge of changing their lives. What do I want in life? Now, in 5 years, and in 10? How can I be kinder and more supportive of myself? How can I be kinder and more supportive to others? When do I feel most energized? When do I feel most successful? Am I in good health or am I in the pursuit of it? Am I engaged in personal development? What fears do I have? Answering these questions doesn’t have to be done in one night. Instead, these questions should be reflected on before beginning your life audit to help you hone in on what you’re doing, where you can improve, your strengths, and what you want and need. Once you have a strong indication of where you are and where you want to be, it is time to start your life audit. Once you have listed and categorized your post-its, it is time to focus. Notice your life themes and your wants of today and the future. Determine the steps to take to achieve your goals. Above all else, remain honest with yourself and commit to making change.